"A game that is much scarier than it looks!" 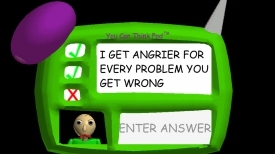 Baldi’s Basics in Education and Learning may sound like an educational game, but it is actually a horror game filled with jump scares although there are parts where you will need to answer very simple math questions but at certain points these questions will be impossible to answer or even read and if you get the questions wrong you will make Baldi very angry indeed, although you may get some prizes such as shiny quarters if you answer correctly. 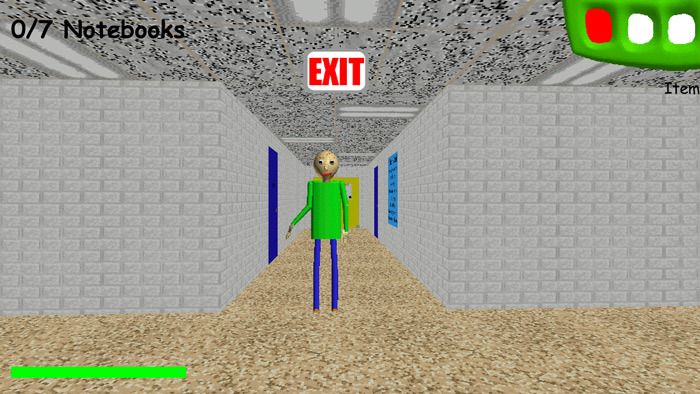 What is striking about Baldi’s basics in Education and Learning is that although the setting is bright and colorful and inviting it still has the ability to make you jump without usual the standard horror trope of being incredibly dark, the game manages to find a fine balance between a happy and enjoyable game yet still scary at certain moments. Do beware as the warning states at the beginning game this is not actually an educational game despite the title and can be quite scary at times, although after your first introduction to Baldi he may seem like a nice and kind man….he is not! A fun game filled with jump scares, you can download Baldi’s Basics in Education and Learning here for free.